Resources come from a wide range of sources. This section is dedicated to addressing the natural resources that give us energy for powering our homes, cars, factories, etc. Natural resources such as water and air have already been addressed. Most of the world’s energy comes from fossil fuels such as coal, oil, and natural gas which take hundreds of millions of years to be created underneath the Earth’s surface. They are created from the remains of dinosaurs and other animals from the Cambrian (500 million years ago) and Pliocene Period (5 million years ago). 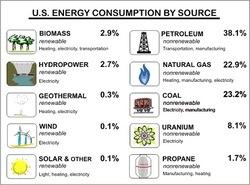 After these non-renewable resources are used up, this form of energy will no longer be available. The problem not only lies with the depleting resources. The main problem is how these resources are turned into energy and what the uses of these energy sources do to ecosystems. Our natural ecosystems are in danger, as a result of the collection of fossil fuels such as coal and oil. We don’t hear about the stripping of the vitality of the Earth's land while mining for coal on the news, but we hear about the collection of oil sometimes resulting in oil spills that ruin sea life, and coast lines.